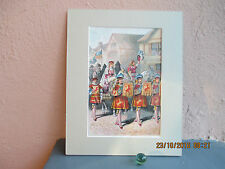 Print is titled: " SONG OF THE FAIRIES " and is in great condition. The actual print is much sharper than this scan depicts. For sale: BLUE BEARD (Blaubart), wood engraving by Gustave Dore, from the 1870 Marchen Nach Perrault Neu Erzahlt von Moriz Hartmann, Illustrit von Gustav Dore — or, Fairy Tales Retold by Perrault. We recently stumbled upon an amazing, and rare copy of the 145-year oldMarchen Nach Perrault Neu Erzahlt von Moriz Hartmann, Illustrit von Gustav Dore — or, “Fairy Tales Retold by Perrault. ”. We recently stumbled upon an amazing, and rare copy of the 145-year oldMarchen Nach Perrault Neu Erzahlt von Moriz Hartmann, Illustrit von Gustav Dore — or, “Fairy Tales Retold by Perrault. ”. The book was sadly ruined, but Dore’s exceptional engravings remained intact. 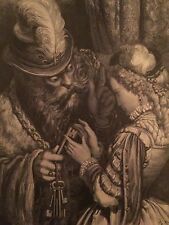 For sale: BLUE BEARD (Blaubart), wood engraving by Gustave Dore, from the 1870 Marchen Nach Perrault Neu Erzahlt von Moriz Hartmann, Illustrit von Gustav Dore — or, Fairy Tales Retold by Perrault. (My favorite is the gargoyle, in this image!). This lithograph illustrated page depicting Cinderella and Prince in a parade was taken from the 1893 book, Rays of Sunshine. The illustrator was not credited. All materials are acid free. The illustration is original to this edition and is not a copy. All materials are acid free. The illustration is original to this 1889 printing and is not a copy. The illustrator was not credited. All materials are acid free. The illustration is original to this edition and is not a copy. This engraving depicts Cinderella trying on the slipper and was taken from Chatterbox, an 1879 anthology for children. The stories in this Chatterbox annual first appeared in newspaper serials. The illustrator of this story was Gustave Dore. All materials are acid free. The illustration is original to this edition and is not a copy. 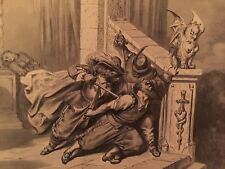 For sale: RICKY OF THE TUFT (Riquet mit dem schopf), wood engraving by Gustave Dore, from the 1870 Marchen Nach Perrault Neu Erzahlt von Moriz Hartmann, Illustrit von Gustav Dore — or, Fairy Tales Retold by Perrault. 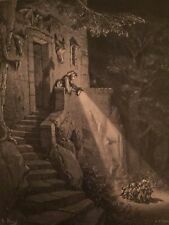 For sale: THE TALE (Die fee), wood engraving by Gustave Dore, from the 1870 Marchen Nach Perrault Neu Erzahlt von Moriz Hartmann, Illustrit von Gustav Dore — or, Fairy Tales Retold by Perrault. We recently stumbled upon an amazing, and rare copy of the 145-year oldMarchen Nach Perrault Neu Erzahlt von Moriz Hartmann, Illustrit von Gustav Dore — or, “Fairy Tales Retold by Perrault. ”. All materials are acid free. The illustration is original to this 1889 edition and is not a copy. 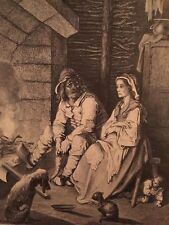 This engraving of the sad, despondent Cinderella sitting by the fire was taken from the 1879 Chatterbox, an anthology for children. The stories in this Chatterbox annual first appeared in newspaper serials. This wonderful illustrated page depicts Cinderella washing dishes was taken from an 1893 book, Rays of Sunshine. The illustrator is not credited. All materials are acid free. The illustration is original to this edition and is not a copy. This chromo lithograph illustrated page depicting Goldilocks at the Three Bears' door was taken from the 1893 book, Rays of Sunshine. The illustrator is not credited. All materials are acid free. This wonderful illustrated page depicting Goldilocks tasting the porridge was taken from the 1893 book, Rays of Sunshine, a collection of children's stories. The illustrator was not credited. All materials are acid free. Bernard Boutet de Monvel (9 August 1881 – 28 October 1949) was a French painter, sculptor, engraver, fashion illustrator and interior decorator. Original 1898 stone lithograph – Not a copy or a modern reprint. This lithograph illustrated title page of "Cinderella" was taken from the 1893 Rays of Sunshine, a collection of stories. The illustrator was not credited. All materials are acid free. The illustration is original to this edition and is not a copy. 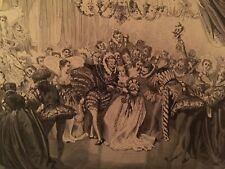 Lithograph depicts Cinderella with her Fairy Godmother. Lithograph has really vibrant colors and is in very good condition. The reverse side is blank and does not have anything printed on it. The actual lithograph is much more lovely in person. Lithograph depicts a scene from the Fairy Tale Sleeping Beauty with Prince Charming about to kiss Sleeping Beauty. There is a wonderful old spinning wheel in the scene and beautiful flowers. Lithograph has really vibrant colors and is in great condition.